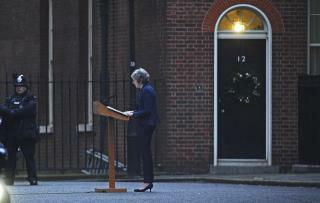 (Newser) – British politics has been thrown into further chaos and Brexit into doubt Wednesday as Conservative lawmakers triggered a no-confidence vote in Prime Minister Theresa May that will see her removed as party and government leader if she loses. May vowed to fight the challenge "with everything I've got," after Graham Brady, who heads a committee overseeing Conservative leadership contests, said he had received letters from at least 48 lawmakers asking for a vote. Brady said the vote would be held in Parliament between 6pm and 8pm on Wednesday, with the results announced soon after. The announcement puts Britain's already rocky path out of the European Union, which it is due to leave in March, into further question, the AP reports. May like all establishment politicians doesn't care what the citizens want. They voted to leave the EU but she doesn't agree so she has been doing all she can to delay and lie. Enough. After the news the other day, I was expecting to find her locked in a convertible. I sure wish we had no confidence votes like this for Trump because he would have been out in the first week instead of being inflicted on us for two years so far.